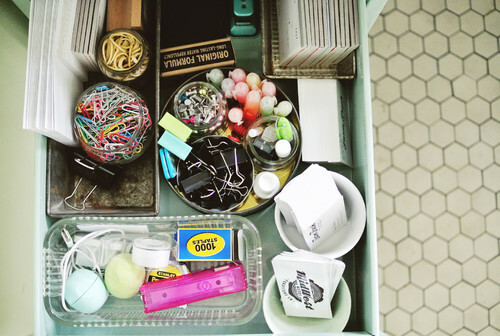 It’s every home’s dirty little secret: that dreaded kitchen drawer crammed with junk. Who knows what’s in there or how it got there—loose batteries, old cellphones, matchbooks from restaurants you haven’t visited since a Bush was in the White House, nonworking pens. But if you’ve vowed to tame this crazy catchall, it’s not as hard as you might think. 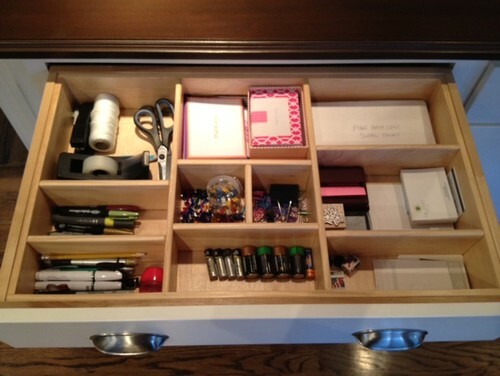 Just heed these junk drawer organization ideas to turn all that chaos into order, and keep it that way. 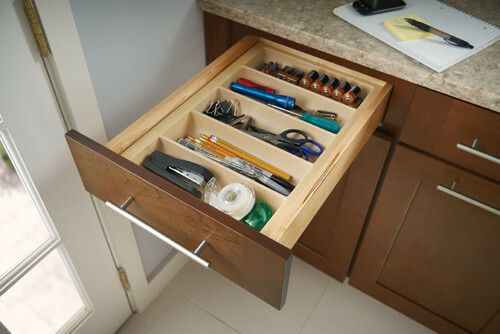 Simply calling it a junk drawer puts you at a disadvantage, experts say. Banish this phrase from your vocabulary, recommends Julie Coraccio, a professional organizer at Reawaken Your Brilliance in Raleigh, NC. 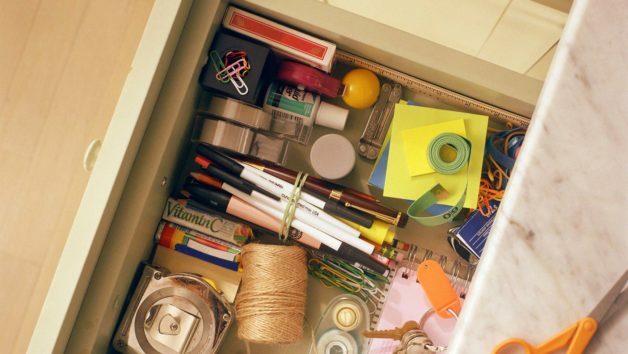 10 Things to Toss From Your Junk Drawer Now: How Many Are Hiding in Yours? “It becomes way too easy to clutter up this space if you’ve already declared it to be junk,” she explains. Instead, come up with something more jazzy, such as “Donald’s Drawer of Delights” or “Cheryl’s Secret Stash.” If you name it something cool, you’ll be more likely to store items in it that fit the category. “Be sure to keep the name broad, so you have some leeway,” says Coraccio. And if items don’t fit with the drawer’s new label, don’t put them in there! Yup, dump it out. Find some space on the kitchen counter, dining table, or the floor, and take a chunk of time to go through the contents. Dispose of anything that’s obviously garbage, including takeout menus to restaurants that have closed and keys to locks in your old house. And let’s not even talk about the candy wrappers your kids have tossed in there. Trash ’em all! Deciding what to keep depends on your drawer’s purpose. “Consider stocking it solely with things you need access to regularly, such as scissors, pens, rubber bands, twist ties, instructions for the baby sitter, a list of emergency numbers, and a set of backup house or car keys,” suggests Heather Walker of Functional Spaces Organizing in San Rafael, CA. Julie Ramsey, the pro behind Toss.Keep.Organize in Pacific Palisades, CA, also includes a small flashlight, sunglasses, an extra phone charger, a notepad, and a screwdriver. “This way, you don’t have to go to the garage every time you need it,” she notes. Here’s what not to keep in your drawer of awesomeness, says Ramsey: important documents (e.g., tax returns, birth certificates), checks, and money. “Most tools should be housed in a toolbox, including picture hanging hooks and nails,” she says. It’s fine to have a small stack of takeout menus here, but if they number more than 10, consider a file. Keep like items together and in the room where they make sense, she advises. “For example, dryer sheets and that stain stick should always be in the laundry room, office supplies live in the office, and house personal hygiene items in the bathroom,” she says. Now for the fun part, you can either buy or recycle containers that’ll fit this drawer’s contents to keep it neat and tidy. “I don’t use special dividers or containers in my drawer, mostly because there’s not a lot of stuff in it,” says Coraccio. She’s also not a fan of buying containers when you can make do with things around the house. For example, small plastic bags are easily labeled with a marker, and those little boxes that come with your checks are the ideal size for holding most items, she notes. Ramsey suggests compartmentalizing by using either jars or square containers, which you can mix and match. “I like to keep my hair ties in a jar, but my flashlight and screwdriver in a long container that fits their size,” she says.